Classic “big head, little body” type of caricature, incorporating the guest’s favorite sport, hobby, or occupation. Friendly, cartoon style with mild exaggeration and great likenesses. 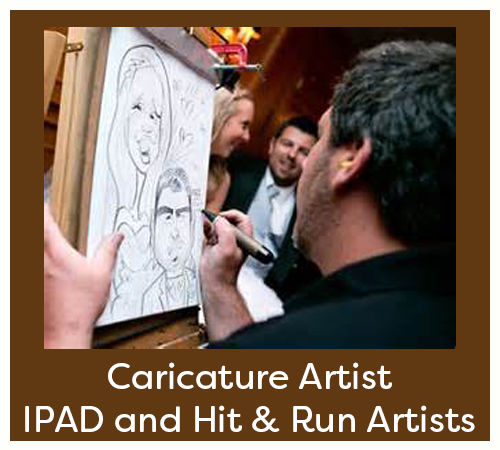 Modernize your experience with our IPAD and Hit and Run artists. The embodiment of art, beauty, and mystery. With swords balanced, veils flowing and finger cymbals chiming out ancient rhythms and modern melodies, this group will forever change the way you think of belly dance. From custom choreographed stage productions to solo acts; traditional to cutting-edge modern. Always spectacular and timelessly entertaining. 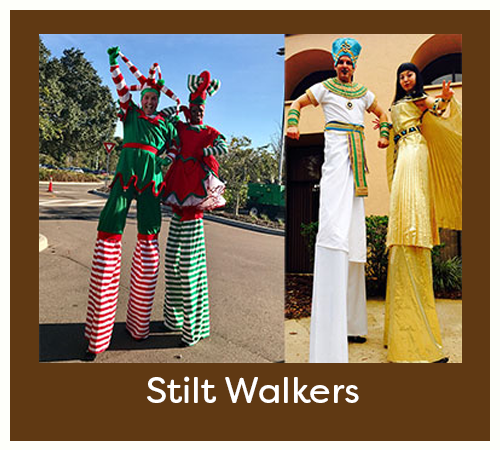 Talented stilt walking characters who provide colourful, visual spectacles with larger than life interactive personalities. 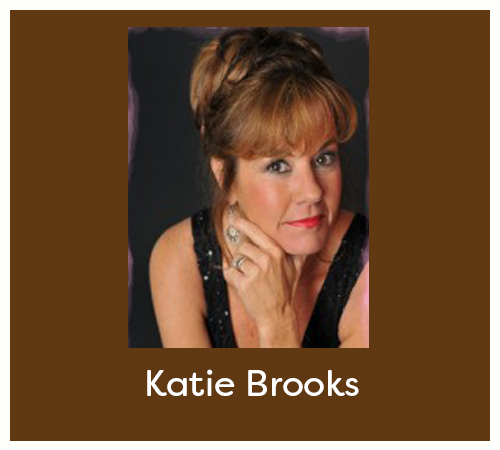 These highly skilled entertainers will brighten up any event and are always by their very nature, a highlight. From a beautiful Vegas Showgirl to the variety of our celebrity look – a – likes such as James Bond, Marilyn Monroe, Jay Leno & Lucile Ball (just to name a few)…We have just the right entertainer to put the WOW in your next themed event. 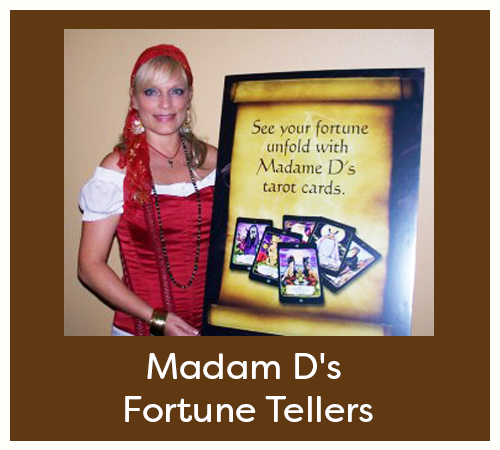 Psychic Entertainers create a opportunity for guests to experience something they probably haven’t ever tried before but were always intrigued by. Contained in a fun atmosphere filled with friends & colleagues who can enjoy the experience over sharing their readings. Great for Halloween & Mardi Gras parties! 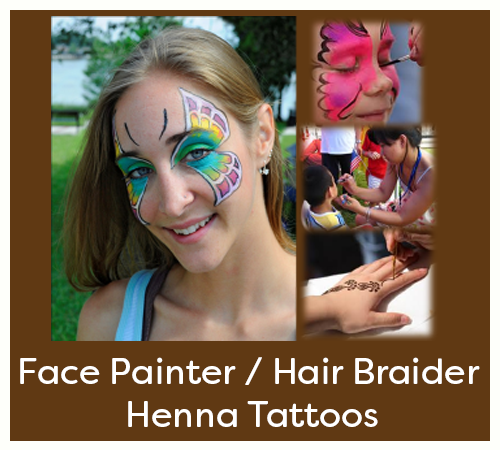 Glitter Tattoos are the hottest form of temporary body art in the world today and are a fun way to entertain guests of all ages at parties and special events. Don’t forget one of our professional hair braiders for your next party. Our parties are infused with excitement! Each member of our gaming staff is a neatly groomed professional who will impress the most experienced gamblers as well as coach the novices. 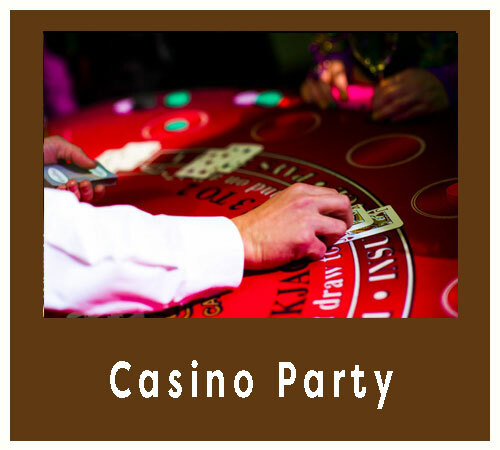 Every guest has a chance to be a winner at the casino while playing blackjack, roulette, poker, craps & the big wheel. Excitement is contagious when guests are “paid to have fun”! 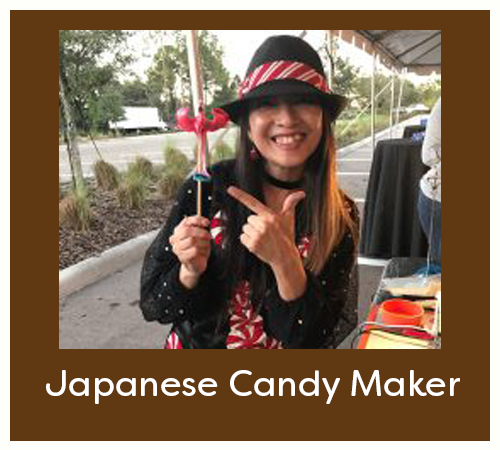 The popular performer displays the unique skill of candy art, creating a huge variety of intricately detailed animals out of molten candy, right in front of guests eyes. Think Judy Garland. Think Peggy Lee, Mitzi Gaynor, Doris Day, Rosemary Clooney, Dinah Shore, Patti Page, Jo Stafford, and Patsy Cline. Think Karen Carpenter and Linda Ronstadt. Throw in a little Bette Midler and Diana Krall. Now imagine a distinctly original artist. Think Classic. Great video entertainment system that will keep your guests and customers overly satisfied with laugh out loud fun. Your larger than life head on a choreographed dancing body, gives the impression that you are an accomplished dancer for a variety of songs & stage scenarios. 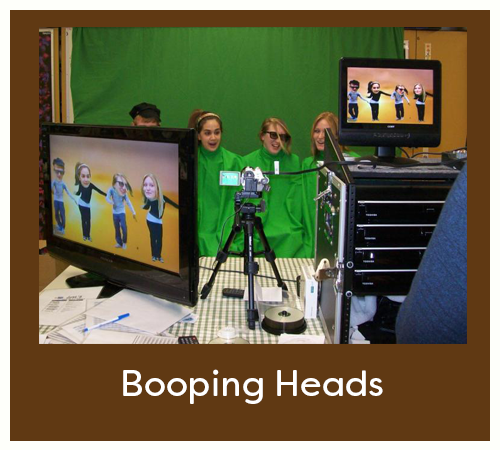 Guest receives a copy of their Bobbing Heads experience via email to replay at home! Santa, Bunny, Princess, Super Heros, and more. Make your next event truly special. 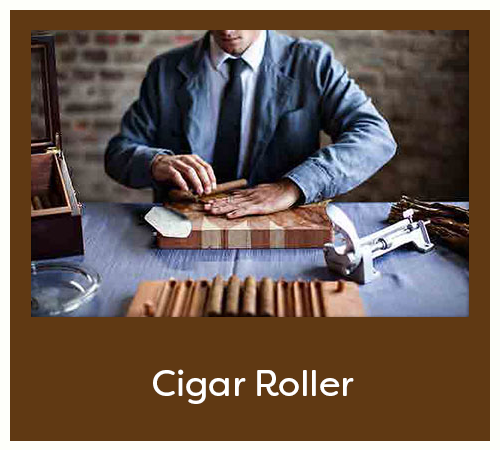 Hire a professional cigar roller to entertain and delight your guests. Customized cigar bands also available upon requests. 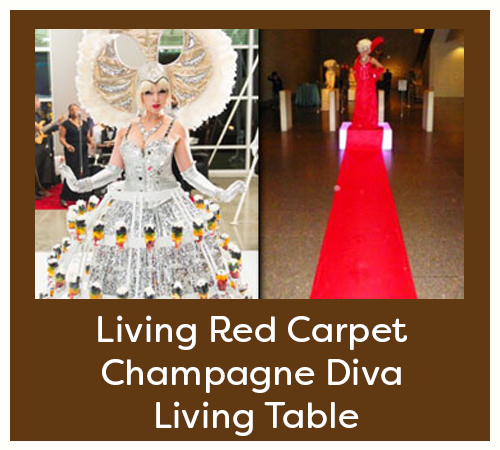 The “Champagne Diva” strolls around your event serving up to 144 beverages or dessert shots, as guests self-serve directly off her “gown”. Guests will be welcomed to your party by our Living Red-Carpet greeter to realize that they are standing on her Dress! Guests can pose for a photo, grab a specialty cocktail, and more. 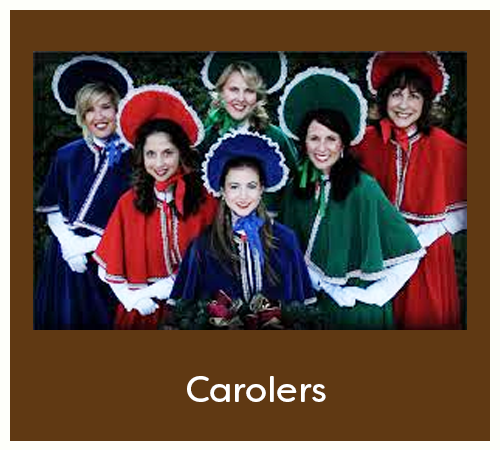 The CHRISTMAS CAROLERS are the perfect choice for any type of Holiday Entertainment! Awesome a cappella Christmas music for your party! 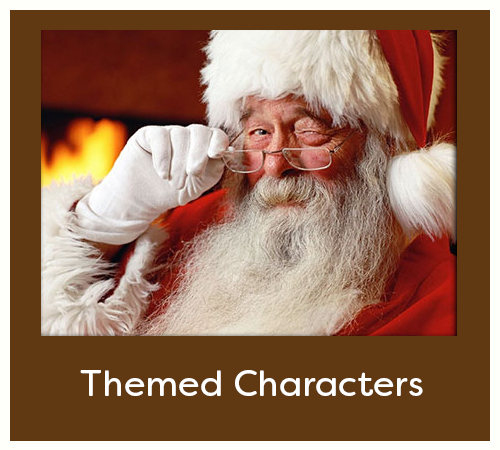 These gorgeous costumed caroler singers can stroll through your Christmas party, or be the focused musical entertainment of the event with orchestral tracks and sound system. Photo booth rentals for weddings and events. 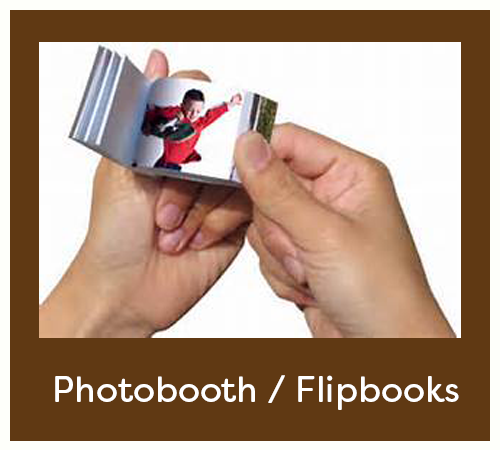 FLIPBOOKS takes the idea of a traditional photo booth and flips it on its head! We have set out to create a rad, modern version of a photo booth in a sleek and sophisticated package that prints out FLIPBOOKS!